Wood replacement spigot with cork sleeve for Kombucha Kamp USA Made Artisanal Stoneware Brewer or other vessels that fulfill the dimension requirements. These high quality spigots are easy to install and remove. To create a tight seal, firmly insert the spigot into the hole in your vessel and fill with water so it covers the spigot. It may leak at first but as the water swells the cork lining and wooden spigot, a tight seal will form. Sometimes yeast or bits of SCOBY may collect inside the spigot and clog up the flow. This is perfectly normal but can be frustrating. Use the FREE spigot brush included with every KKamp spigot to dislodge the blockages. If the brew has molded, throw away all SCOBYs and liquid from the brew, then soak this spigot in distilled white vinegar or very sour Kombucha vinegar for 2-3 days to kill any spores in the wood prior to starting the brew again. I purchased one spigot to replace an old one on my earthenware vinegar making jug. A tight seal was easy to obtain by slipping the cork ring off of the spigot, placing it in the jug's opening, and then pressing the spigot into place. It's a nice piece of work and turns easily. I appreciated receiving a cleaning brush as well. Thank you Hannah! I have received the shipment in good condition and the spigot works fine. First I would give the service I received when ordering a 5. Patient, knowledgeable & helpful. 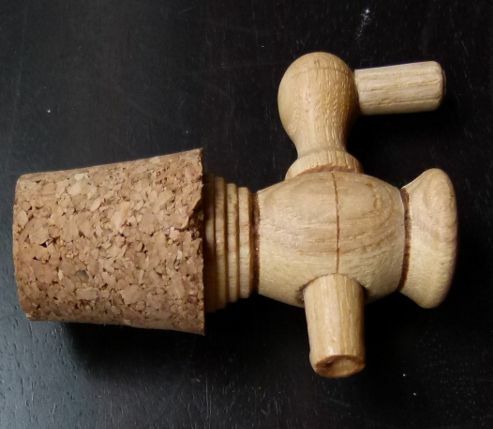 Also, when I had trouble with the cork spigot, your response was quick & supportive... when the cork cracked, you immediately emailed me saying another spigot was in overnight mail. I couldn't recommend this web site more confidently! 5 stars! I love Kombucha Kamp, period. No, I mean, exclamation!!!! So far, I'm impressed with their customer service and standing behind their products. Unfortuantely, after a few months of use, my wood spigot did start to leak...and pretty bad. I couldn't for the life of me clean it or fix it. It seems that the temperatures may have been just right that the spigot shrunk just enough that it left an opening. Their was no clog, there was no mushroom. I had taken it out and clean it many times. However, after KK sent me a replacement free of charge, the old spigot actually started to work again, and without touching it. I can only imagine that it was weather related. I am a huge fan of this wooden spigot. It doesn't leak and has never clogged. I ordered one to use with the toasted oak barrel (also procured from kombucha Kamp), and I liked it so much that I ordered a second one for another application. I have this for the custom made pottery vessel and it works really well. The second vessel I installed this one we discovered that the spigot portion actually comes apart from the cork. Therefore we put the cork in first and we were able to fit it in further much easier than trying to install it as a complete unit. Once the cork was in place we put the spigot in place and there were absolutely zero leaks. Currently I'm leaving water and vinegar in the new vessel as I wait for my scoby to arrive to start a new CB. I do recommend this product. I love these wood spigots and prefer them over the metal ones. They are easy to clean with either the small brush or a bamboo skewer. I am concerned about heavy metals therefore I use the wood spigot. I have 3 of the 2.5 gallon vessels and these work perfect. When one gets clogged with mushrooms I simply replace it with a new one while cleaning the used one. Just make sure you allow it to thoroughly dry before storing. Love this! I had purchased a cheap Aladin pouring jar and the plastic spigot was useless. Wanted it for kombucha and knew I had to buy a spigot anyway, so no large concern. But thrilled when this spigot came! It fit perfectly in the rubber gasket that was already in the jar. Super simple to just push into that gasket. Does not leak. Appears to be sealed with some sort of wax, and I plan to use beeswax to reseal it if/when the need arises. Flow stream is small, but functions perfectly. Love these spigots! They fit in my glass vessels perfectly, create a tight seal, are easy to use and flow freely. I'm so happy to have found them!